It's not the years honey, it's the mileage. We know you're bored of not being able to download any new 3D games to your beloved 3DS, and that any announcement of future 3DS downloads is like a faraway carrot, but indulge us anyway. Enjoy Gaming has just announced Pyramids, a puzzle-platform adventure coming to download later this year. You play a fearless adventurer — wearing a hat, of course — who must escape from the titular tombs with as much loot as he can carry, avoiding traps and enemies along the way. You'll have TNT and a gun, but the emphasis is on using your shovel to destroy and create blocks to help you make your way to the exit. The game will include 54 levels, but in a neat move more will be made available by scanning a QR code on the Enjoy Gaming website. July, 20, 2011. Enjoy Gaming ltd., Worldwide digital and European retail publisher, presents “Pyramids” on the Nintendo eShop™ of the Nintendo 3DS™. Pyramids will be the first Nintendo 3DS™ game released by Enjoy Gaming ltd. 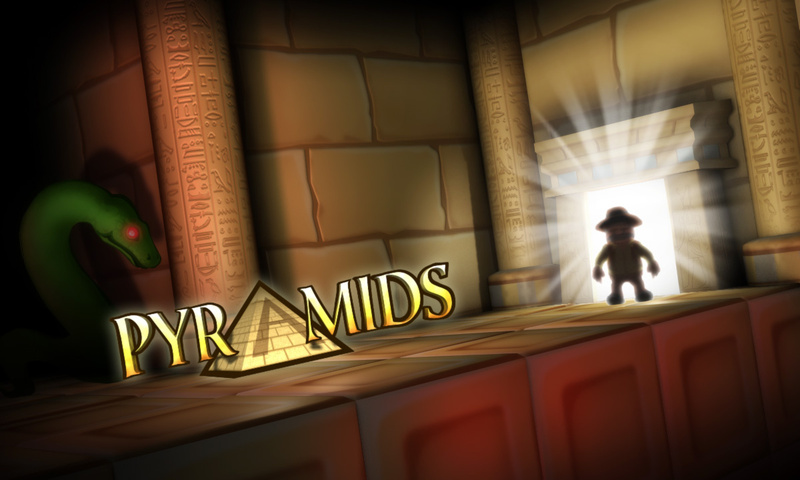 The game will let the player use QR code to unlock free news levels put on the pyramids web page. I'm for it. I like the Solomon's Key-nish of it. Reminds me of Solomon's Key. It reminds me of Toki Tori. I hope we won't have to wait very long. I'll take any 3DSWare I can get. it's a start.......... that's all I'll say. reminds me of Rabbids 3D, well, the background does. An original game on the eshop? What is this blasphemy! Interestingly on their Youtube page it says coming this summer... so if it is indeed for summer it has to come in the next 5 weeks or so. Hope more eShop goodness is announced in the coming weeks. Looks alright, can't say I'm interested. I like the concept, but that looks like something created in Flash. Hey it's 3DSWare. Practically a must-buy already. I like that QR implementation! I can't really say anything about this. It looks like it could be some fun, but it also could be a total disaster. I cannot wait to see how this turns out though. A first original 3DSWare was completely unexpected. But all I can say is hurry up with the update tomorrow, Nintendo! @Ryanthehedgehog This isn't the only original upcoming original 3DSware, here is a list of upcoming 3DSware. Reminds me of that Treasure Hunter X game I recently downloaded from dsiware. Unlike Mutant Mudds and Mighty Switch Force, I don't see what 3D brings to the table at all. I don't feel like every 3DS title needs to focus on 3D. It still looks better than an equivalent DSi game would. Enjoy Gaming doesn't have the greatest track record, but this one looks somewhat interesting. Why does the adventurer look like a cut-out? You had me at titular James. I doubt this would be getting as much recognition as it is if 3DSware wan't so lacking as it looks like an pretty average game. Reminds me somewhat of Minecraft. Hmm... I feel a Solomon Key, Mighty Bomb Jack, Lode Runner, Spelunker type of vibe if that's even possible. This game looks... solkeymibomjacklorunspelunk-ical... yeah, that's it. Definitely interested in this one. Looks pretty cool! So far, the only 3DS-exclusives are a classic 3D remake, a museum, and streaming videos. Give us new games, please!!! What's with the white line around the main character? Yeah, he looks like a cut-out. Very strange! Dont see how everyone is so interested in this one. It looks really boring with a cheap game mechanic.